What does Dominican Republic Food consist of? Is that your question? 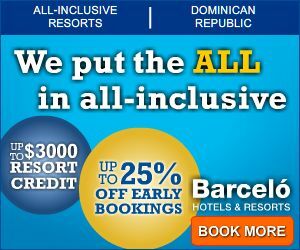 If you are like most people that travel to Dominican Republic, you probably stay in all-inclusive resorts. to try some Dominican Food. 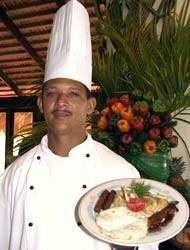 That night they will serve the most typical Dominican dishes. 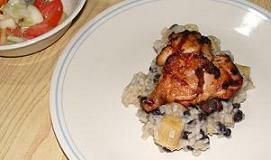 Dominican Food is a blend of Spanish, African and Taino cuisine. Rice, Beans, Plantains, Pork, Chicken and Seafood are the most common ingredients used. 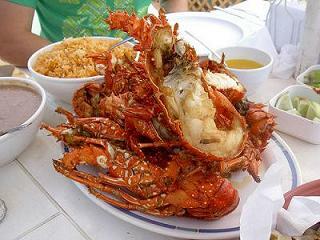 Dominican Republic Food is described as Comida Criolla or Creole Food. Creole Cooking consists of white rice, black or red beans, plantains and occasionally pork, goat or to a lesser extent beef. 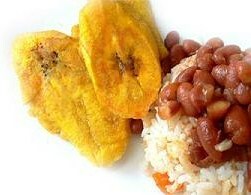 Beans are a very important part of the Dominican diet. They are a good source of protein for those who cannot afford meat. 2. Put plantains in a pot of water with salt. 3. Bring to a boil and cook until plantains are soft enough to mash. 4. Chop the onions and saute in a pan with olive oil. Salt to taste. 5. Serve the mashed plantains with sauteed onions on top. Sometimes all it takes is a walk down the beach to find a little restaurant with delicious, fresh seafood! So if you are wondering what kind of Dominican Republic Food you'll be eating when you go there, I can tell you from experience that you'll notice the Spanish influence in Dominican Food but most of the time the menus are adapted to satisfy tourists from all over the world. 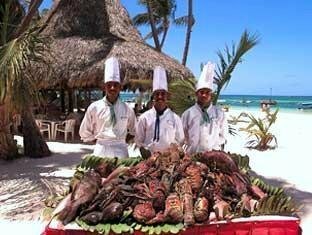 We have stayed in several all inclusive resorts in Punta Cana and one in Cabarete and the food was pretty similar in all the resorts. I wanted to share this Caribbean Food recipe with you. My husband made this dish when we were in Cabarete in July of 2009. 2. Pre-heat the grill on medium heat. 3. Place the legs on the grill, with the lid open. 4. In a medium sauce pan, heat the oil over medium heat. rice gets evenly coated by the hot oil. 6. Add 1/3 of the water, stir and let it gently cook. 7. Add the thighs to the grill and turn the legs over. Cook for 5-10 minutes. 8. When the rice is almost dry, add another 1/3 of the water. 9. Turn the thighs over on the grill, add the breasts to the grill. 10. 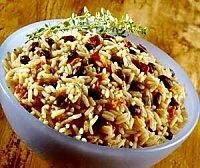 When the rice is almost dry, add the rest of the water, beans, corn, artichokes, and champignons. Cook until almost dry and slightly creamy. 11. Flip the breasts on the grill and cook until the juice runs clear. 12. Add the butter, tomatoes, and mango to the rice. 13. Put a mound of rice on the plate and put the chicken on top. Serve. Dominican Republic Food is delicious!